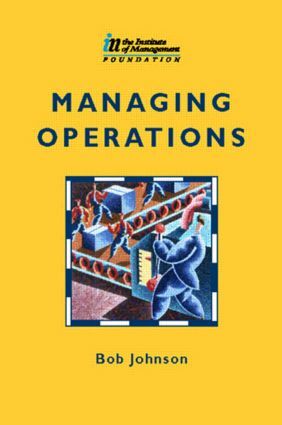 Managing Operations is a concise guide to the fundamentals of operations management. Using examples and case studies from public, private and voluntary sector organizations, this book will enable managers to develop their competency to an excellent standard in an industrial or commercial setting. As well as being very practically based, Managing Operations also provides the theory behind operations management. The book is based on the Management Charter Initiative's Occupational Standards for Management NVQs and SVQs at level 4. It is particularly suitable for managers on the Certificate in Management, or Part 1 of the Diploma, especially those accredited by the IM and Edexcel. Managing Operations is part of the highly successful series of textbooks for managers which cover the knowledge and understanding required as part of any competency-based management programme. The books cover the three main levels of management: supervisory/first-line management (NVQ level 3), middle management (Certificate/NVQ level 4) and senior management (Diploma/NVQ level 5). Also included are titles which cover management issues in particular sectors, such as schools or the public sector, in more depth. You will find a full listing of other titles available at the front of this book. Bob Johnson is a freelance management consultant and trainer with extensive experience of the retail, service, government and voluntary sectors. He has managed operations in the sales, marketing, purchasing, training and consultancy functions.